Dive alongside bull sharks in Playa del Carmen with a 2-tank dive that's a remarkable chance to see powerful predators in their natural habitat. Bull sharks return each year to breed off the Playa del Carmen coast, and you'll have two opportunities to spot them as they swim in the shallow water. 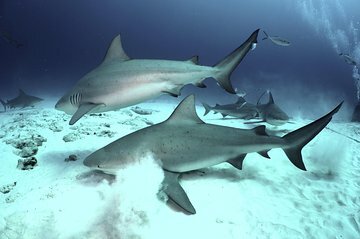 Dive once in an area with a sandy bottom that attracts many bull sharks, then take a second reef dive for even more time in bull shark territory.